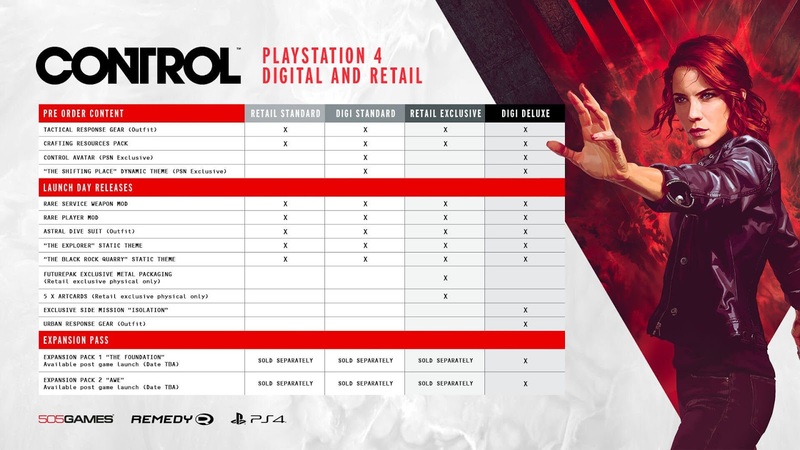 Control Pre-Order and Preview Day Wrap Up! Yesterday saw a crazy amount of new information about Control. In addition to pre-orders rolling out worldwide across three major platforms, we also had a media embargo being lifted on interviews and impressions from GDC! While we had articles yesterday detailing the latest news, there was so much stuff that we just had to step back review everything that was announced in the past 24 hours in a special breakdown post. The game will launch on the Epic Store, before being released later on Steam. For players who pre-order through Epic, they will receive the Tactical Gear outfit and Crafting Resource pack. At present, there will only be a digital release of the game on PC. The Retail Standard edition and Digital Standard edition of the XBOX One version will both contain the Tactical Response Gear outfit and the Crafting Resources pack, similar to the PC edition. HOWEVER. If you purchase the Retail Exclusive version, it will come with all that plus the Futurepak exclusive metal packaging and five art cards, both exclusive to the physical edition. Most of the gameplay impressions were written by journalists who tried out the game at GDC in mid-March. 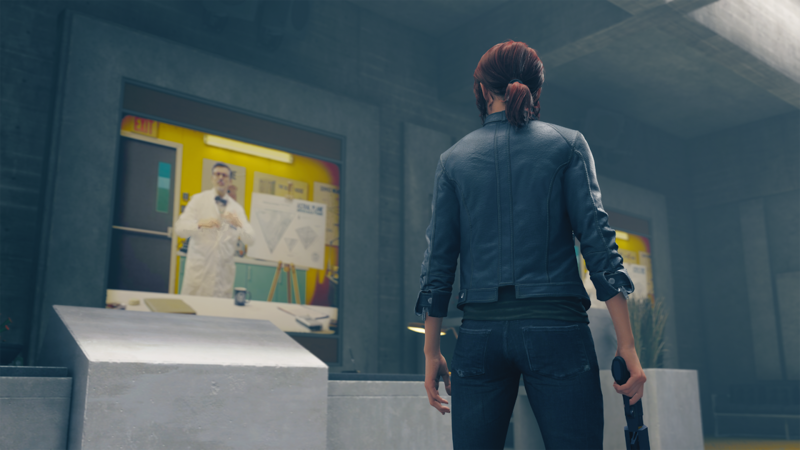 The demo was played on the PS4 Pro and took place in the Central Research lobby. During the twenty minute demo, players were given full control to roam around the area, although combat was at the heart of this demo. Yesterday also saw the release of new videos, including official teasers and hands-on impressions. 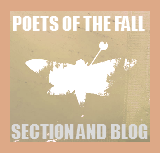 Community members were active yesterday, busy writing and creating gorgeous new work. Following the release of the Tactical Gear outfit, Fraser has sketched another wonderful piece of Control fan art! Patrick breaks down all of the Control previews released since the embargo lifted in an informative new article. Carla recently expanded on a previously-released work, creating adorable 8-bit gifs of all Remedy protagonists. 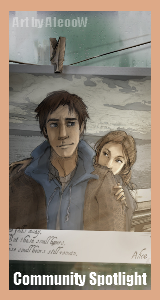 In addition to running the Control Community Discord, Reddit, and Wikia pages, Holly found time to create a gorgeous new piece. 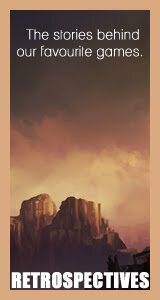 Jesse will inform the player of the situation but there will be no quest markers in the game to lead players. It's all about player agency. The story is delivered through the game's environment, character dialogue, and optional lore. One of the more unusual enemies faced by journalists was a glitchy spikey ball, which holds a similarity to the poltergeist ball found at the Cauldron Lake Lodge in Alan Wake. 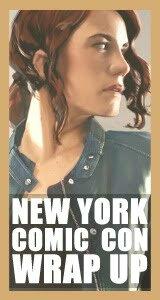 Different players will have different preferences; Rock Paper Shotgun preferred Jesse's power over her service weapon due to the environmental manipulation the player can have. Whereas PC Gamer preferred the multiple functions and spectacle of the gun over the powers. 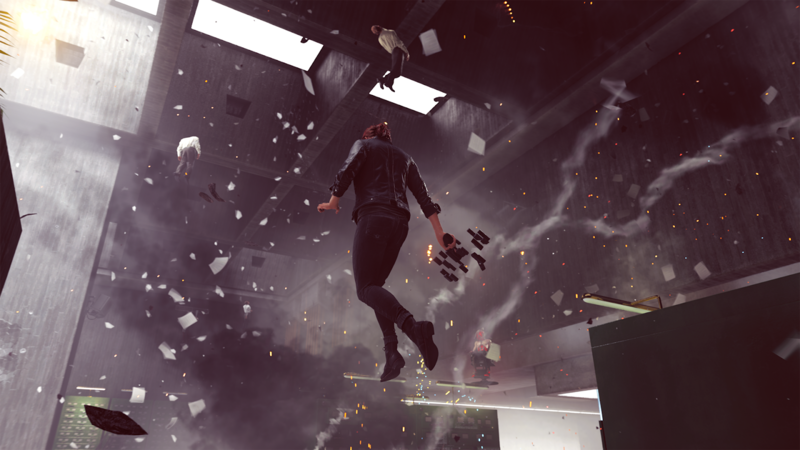 Rock Paper Shotgun described the levitation as "liberating". Journalists were also shown a hub where abilities can be customised e.g. Jesse can control multiple enemies at once, dodge-dash can be used more frequently, and Jesse can levitate for longer. The appeal for the FBC office's brutalist style came from its "simplicity of form, honesty of materials", the office building allows the contrast between order and familiarity, with the supernatural elements. 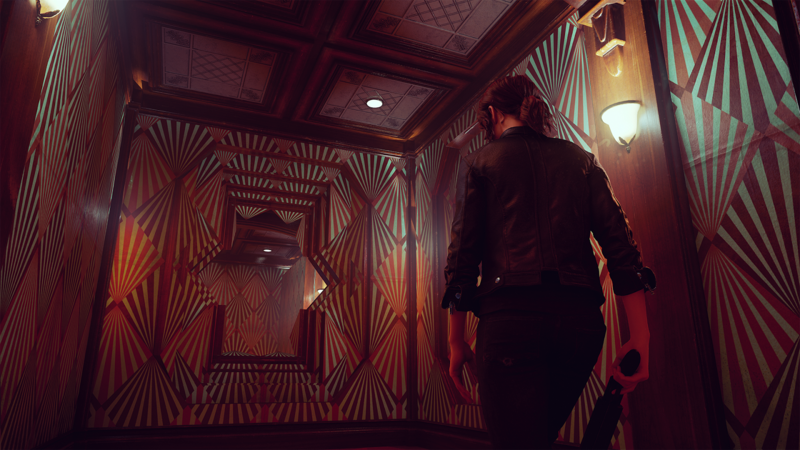 Rock Paper Shotgun described the game as being "Alice delving into sci-fi wonderland" a comment agreed on by Kasurinen who stated that "the deeper she goes into that place, the more strange and complicated it becomes". There will be plenty of alive agents who have been unaffected by the Hiss. The role of Helen Marshall was further expanded on in the Eurogamer article. Her involvement in experimental research allowed her to develop gadgets to help protect from possession. Hidden doors take players to new areas, in Eurogamer's article they discovered a lift that took them to a bathroom reclaimed by plants, where they found a rare upgrade. Bureau Alerts, available post-game, will give the title added replayability. 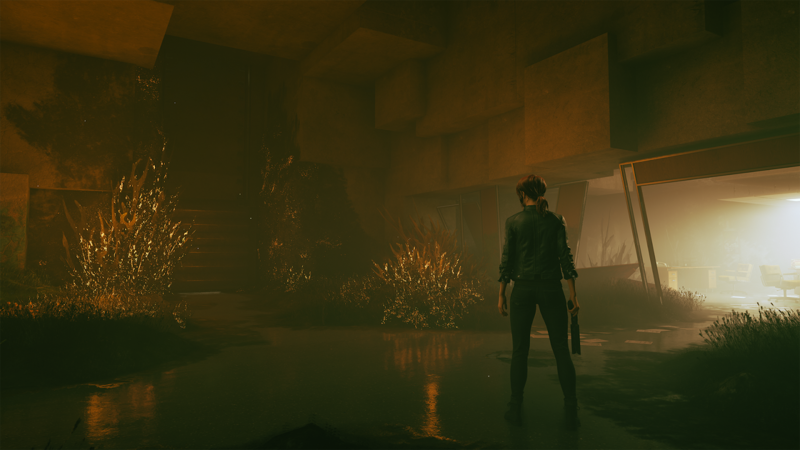 For the game, Remedy had to rethink their approach to game design, choosing to put the world first rather than tell a specific story. 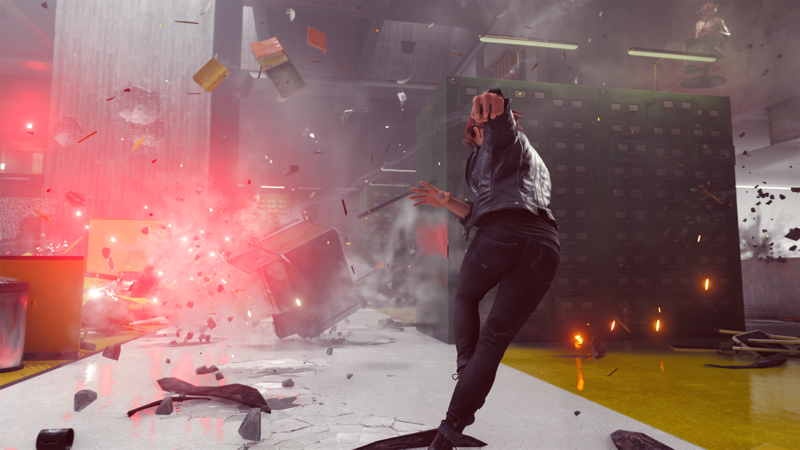 Replayability is at the core of Control with post-game Bureau Alerts, two DLC packs following the main game's release, and Control's open-world level design. The telekinesis sound was specifically praised by Rock Paper Shotgun. Credit was given to the amazing sound team on Twitter. Kasurinen stated that Remedy's approach was "let's try to make a statement than play it safe". [Eurogamer]. To accompany the new previews, a series of screenshots were released! The teasers show Jesse in a number of new locations and a showcase of some of her abilities.